Bring the cream to a slight simmer of bubbles right before it boils. Pour over the chocolate and allow to set 30 seconds. Stir in the honey and Truffle oil. Voila - a Truffles Chocolate Fondue. Let the mixture chill for a few hours and then roll into balls and coat in black cocoa powder. If you ever ask me for my go to chocolate recipe, with no doubt I will give you my fudge chocolate brownies, but if you need a no bake recipe, then this is the perfect one for you! These truffles are rich, soft, vegan and really easy to make. My little nephew is not that little anymore, he is 13 years old now but when he was around 6 he always wanted to help me in the kitchen; recipes like this one were the best to let him be my cooking assistant. He was the one in charge of rolling and decorating the truffles - kids have fun making these. Remember truffles were born in France around 1920s; chef Auguste Escoffier discovered how to make them when he poured hot cream over chunks of chocolate by mistake and noticed that it was easy to make balls out of that chocolate mixture; we are truly thankful, Escoffier! These exquisite chocolate ganache balls have their name “truffle” because they look like the rare black truffle fungus. It is all about a raw chocolate look - a mushroom straight from the ground look... so it is okay that they don't look perfect. Nowadays you can find a lot of different truffle variations. I am going to give you two options to prepare in a vegan way and with cocoa powder instead of chunks. I recommend using high quality ingredients to get luxurious truffles. In a saucepan over medium heat add your coconut oil until completely melted. Incorporate your previously sifted black cocoa powder and sugar; stir continuously, you need all the ingredients dissolved into a smooth mixture. Add the coconut cream and keep stirring for about 5 minutes. The mixture is going to be thicker and with a glossy appearance. Remove the saucepan from the heat, transfer the mixture to another bowl that is not hot, cover and chill it for 3 – 4 hours or until firm enough to shape it into balls. 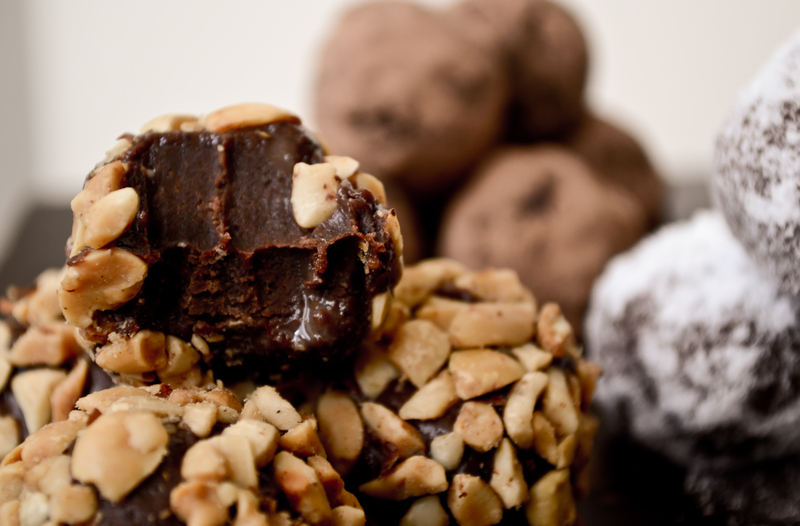 When firm, take a tbps of the chocolate mixture and shape it into a truffle. Roll the truffle in the Rainforest Bulk Cocoa Powder and place it in a tray. Repeat with all the mixture and then refrigerate them for at least an hour so they can set. You can also roll them into powdered sugar or chopped nuts. For holidays like Christmas I like to add 2 – 3 tbsp of rum into the saucepan while cooking to give them a stronger taste. Place all the ingredients in a blender or food processor. Blend until you get a smooth mixture. Place it in a bowl and refrigerate for at least 2 hours or until firm enough to make balls. When firm, take about a 1 tbps of mixture and shape it into a little truffle. Repeat until the mixture is done and then put it into the refrigerator for them to set, around 1 hour. You can also roll them in powdered sugar or chopped nuts. 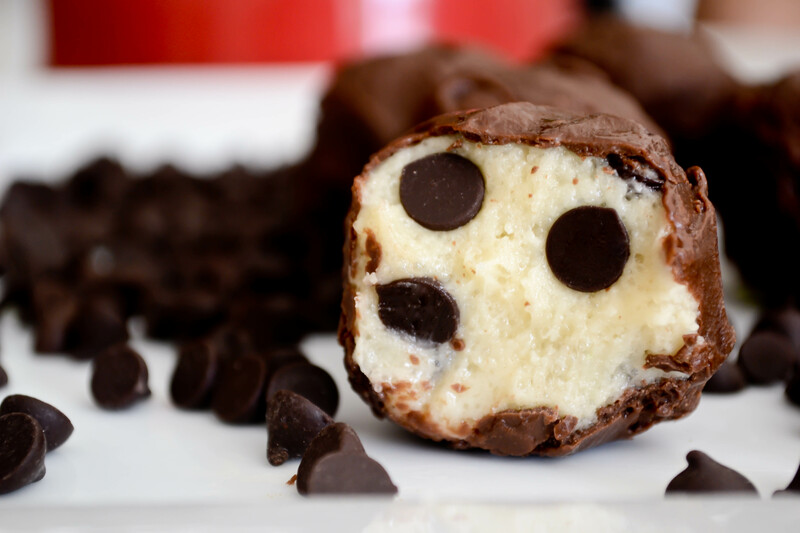 This is the perfect treat for all those chocolate chips cookie dough lovers! How many times did you find yourself eating some of the cookie dough while baking some cookies? Well, now you can actually make the dough as the dessert and forget about all the people that told you to stop eating raw cookie dough because of the eggs. 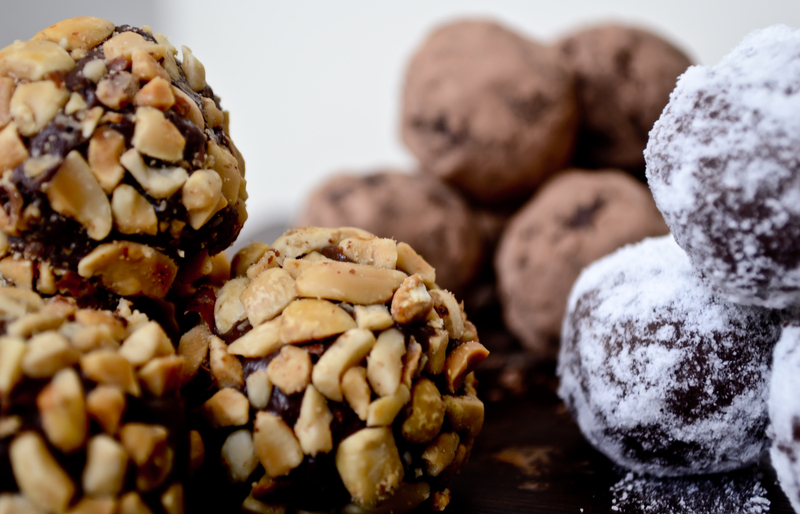 To make these truffles extra delicious, the recipe tells you how to easily temper some milk chocolate to cover the cookie dough. You can skip that step but I recommend you to do it because it will give the truffles a crunchy texture to the bite and also they will look just as good as the ones from your local bakery. In a large bowl, cream together your room temperature butter and sugar. Whisk until you get a smooth mixture. Add the pinch of salt and the vanilla extract. Keep mixing to combine the ingredients well. Incorporate the all purpose flour into the bowl. Don't forget to sift it before to avoid big lumps. It is recommended to always sift your dry ingredients. If you feel the dough is too thick, add the tbsps of milk. Add your Organic Dark Chocolate chips and stir until you get them even all over the cookie dough. Place your raw chocolate chip cookie dough in the refrigerator and let it chill for at least 1 hour. This will help to shape the cookie dough into little balls. While your cookie dough is chilling is time to temper the Belgian Milk Chocolate. 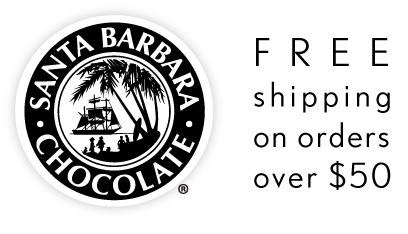 In a double boiler, melt 4 oz of the Milk Chocolate Bulk Couverture. Stir continuously to make sure all the chocolate is completely melted. It is really important to make sure that the water doesn’t touch the pot where the chocolate is. Also, keep the heat low, it will melt slowly but if you rush the melting process, the chocolate can scorch which would ruin the tempering process. When the chocolate is completely melted, make sure it feels warm, take it off from the heat and place the bowl into another bowl with ice. Stir continuously to cool down the chocolate a bit. When the chocolate feels thicker, add the remaining 2 oz of Belgian Milk Chocolate Bulk Couverture and stir until all the chocolate is melted. When your chocolate looks shiny and uniform it is ready to work with it! Take your chocolate chip cookie dough balls from the refrigerator and dip them into the melted Milk Chocolate. Place them in a tray to set. Before setting you can add sprinkles or any other topping you would like!